AC Milan are reportedly focusing in on two key signings while Lucas Paqueta has spoken of his excitement ahead of his move to Italy. The Rossoneri are currently chasing a top-four finish in Serie A this season in order to secure a return to the Champions League. While question marks hovered over their squad already due to the lack of quality depth in key positions, their current injury crisis certainly hasn’t helped matters. Lucas Biglia and Giacomo Bonaventura are long-term absentees in midfield, and so with Calciomercato suggesting that Cesc Fabregas is a priority and is working towards a Chelsea exit, the Spaniard could certainly help address that issue. From the technical quality he possesses to his leadership and experience, the former Barcelona ace could be a crucial addition for Milan to complement the younger players in the squad. However, any move in January would go against what he said himself about his future this week, as noted by Goal.com. Meanwhile, Calciomercato also add that Zlatan Ibrahimovic is edging ever closer to a return to the San Siro, and he could be equally as important. Coach Gennaro Gattuso only has Gonzalo Higuain and Patrick Cutrone available up front to compete on multiple fronts, and so adding Ibrahimovic, who scored 56 goals in 85 games in his previous stint with the Italian giants and won a Scudetto in 2011, would be a very sensible move for the second half of the campaign at least. 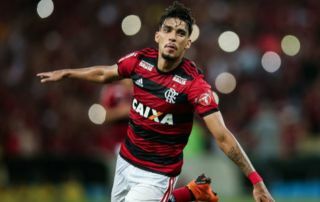 Meanwhile, Paqueta has already had his move confirmed, as noted by Sky Sport Italia, and as he prepares to bid farewell to Flamengo, he has revealed his excitement over starting a new chapter in his career with Milan. “The transfer to Italy is a dream that’s become reality, I only know ‘grazie’ but I’ll try to keep up with the language. I’m already learning,” he is quoted as saying by Football Italia. “When I score I’m always very happy, always dancing for joy. It won’t be any different in Italy. We’ll see if anyone comes to dance with me! The 21-year-old has bagged 10 goals and four assists in 38 games with one more outing left this season in his homeland, and so Milan will hope that he can bring that same quality with him to Italy.